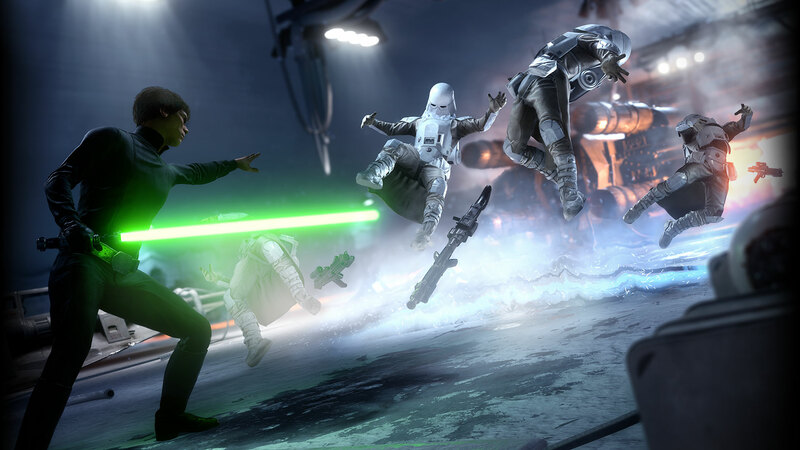 Star Wars Battlefront and all its DLC in one comprehensive package. While both Electronic Arts and DICE have yet to make an official announcement, a recent Amazon listing has revealed that a Star Wars Battlefront Ultimate Edition is apparently on the way and that it will arrive next month. As of the time of this writing, this Amazon listing for a PlayStation 4 copy of Star Wars Battlefront Ultimate Edition is still live, but it may eventually be taken down due to the fact that Amazon seems to have jumped the gun. According to the listing, the Ultimate Edition includes the core game, the five exclusive unlocks which were bundled in with Battlefront’s Deluxe Edition (unlocks which include exclusive emotes, equipment, and the iconic DL-44 blaster used by Han Solo), and all four of the game’s post-launch expansion packs: Outer Rim, Bespin, Death Star, and the as-yet-released Rogue One: Scarif (which features elements from the upcoming Rogue One film). The Star Wars Battlefront Ultimate Edition will only be $39.99 according to the Amazon listing, something which might rub day-one buyers the wrong way considering EA was charging $60 for the core game and another $50 for the Season Pass back when Battlefront first launched. While the listing only shows a PS4 version, it is assumed the Ultimate Edition will launch for PC and Xbox One as well. If the listing is indeed accurate, then the Star Wars Battlefront Ultimate Edition will release on November 18th. Update: Electronic Arts just issued a press release formally announced the Star Wars Battlefront Ultimate Edition. The information the press release contains matches up with what we reported on above.